America’s Best Physical Therapy Whirlpool Bathtubs made in the USA. 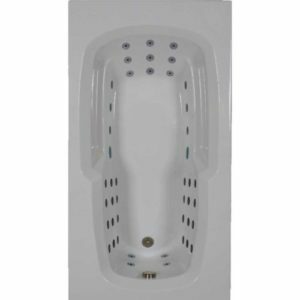 WaterTech’s Physical Therapy whirlpool bath has been developed for the individual who wants or needs an intensive high pressure hydrotherapy massage. A Physical Therapy Bath (PTB) will provide bather an aggressive full body massage. 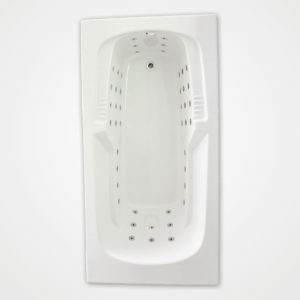 This bath has an end drain that we recommend be ordered with an optional deep soak drain assembly which will increase water depth by 20% if needed. Bath can be filled with either hot or cold water depending on the post operative orthopedic rehabilitation needed. The PTB is available in many sizes and is equipped with many options. See product specifications. A great appliance that fits into most bathrooms that provides homeowners a great place to relax, soak or treat arthritis disabilities and everyday aches and pains. All electrical devices come with a short chord and plug. Available in various sizes & shapes. Call for pricing. Note: Prices do not include freight. Please call for pricing. 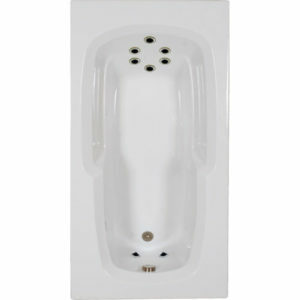 Perfect whirlpool/ therapy bath for any home. Jets provide bather a high intensity massage for the body. Fill the bathtub with hot or cold water to provide post operative rehabilitation massage therapy or simply lay back relax and enjoy a body massage to relieve tension from a long day of activity or stress. Anyone with aches and pains or arthritis will benefit from the effects of warm water caressing the body from shoulders to feet. Electrical devices come with a 2 foot chord and standard plug. Available in various sizes & Shapes. Call for pricing. WaterTech’s new 7236VS vibro sonic massage bath was developed to provide a shiatsu massage for a bathers back and feet. The most immediate effect of a vibro sonic massage is pain relief. Combined with hot water, the massage will allow your body to release the necessary endorphins to relax tired muscles and aching feet.